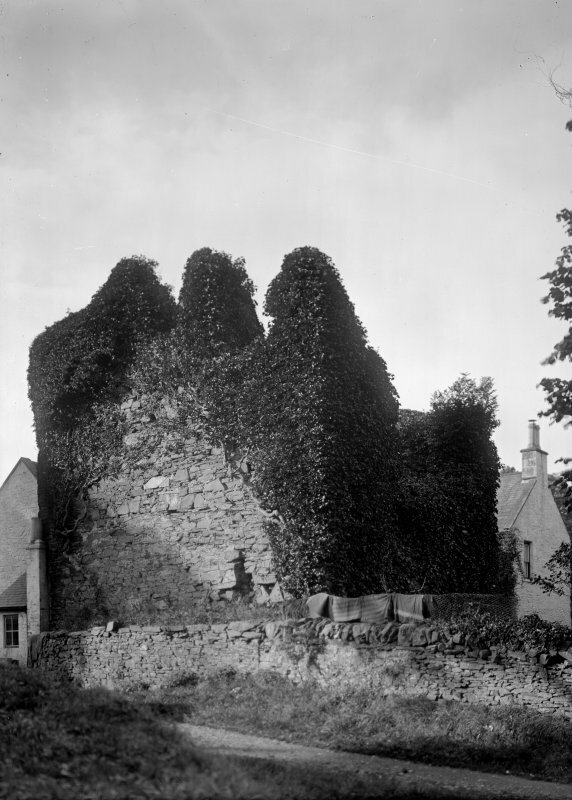 Balmangan Tower, now ruinous, probably dates to the 15th or 16th centuries. On plan it has been a simple oblong measuring 20' by 16' within 4' thick walls. A doorway at the N end of the E wall gives access to the vaulted basement and to a passage leading to a wheel- stair in the NE angle. The walls are much ruined above first floor level. The modern farm-house of Balmangan abuts on the N wall of the tower, which is neglected and ivy-covered. Traditionally, this was the residence of a branch of the McLellans of Bombie (Name Book 1849). Balmangan Tower (name confirmed) is generally as described. The orientation is NE-SW and the doorway at the N end of the NE wall is now blocked. An original doorway in the SE wall leads to the barrel-valuted basement. The remains stand to an average height of c.5.0m and in the middle of the SW wall there is a small horizontal dumb-bell gunloop. Visited by OS (JP) 21 February 1971. NX 65025 45731 (Canmore ID: 63890) Internal alterations to the 19th-century dining room at the NE end of Balmangan Farmhouse exposed a fireplace with a simple roll-moulded stone fire surround of earlier date. It may have been taken for reuse from the 15th- or 16th-century Balmangan Tower, which adjoins the farmhouse at its SW end, but is now ruinous.